1.5 lbs. (1 bag) Side Delights™ Gourmet Petite Real Red, Pure Gold or True White Potatoes, cut in half. Cut beef steak lengthwise in half, then crosswise into ⅛" to ¼" thick strips. Combine ¼ C. dressing and beef in medium bowl. Cover and marinate in refrigerator 30 minutes to 2 hours. Heat 1 Tbsp. oil in large nonstick skillet over medium-high heat until hot. Add green beans; stir-fry 5 minutes. Add remaining 1 Tbsp. oil and potatoes; continue stir-frying 4 to 6 minutes or until potatoes and green beans are heated through and starting to brown. Remove from skillet; keep warm. Heat same skillet over medium-high heat until hot. 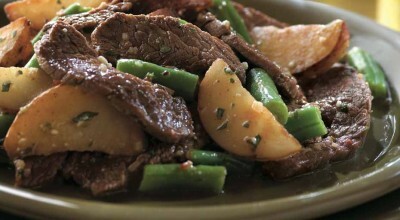 Add ½ of beef; stir-fry 1 to 3 minutes or until outside surface of beef is no longer pink. (Do not overcook.) Remove from skillet; add to vegetable mixture. Repeat with remaining beef. Add remaining ¼ C. dressing to beef and vegetables; toss to coat thoroughly. Season with salt and pepper, as desired. Serve warm or at room temperature. Cook's Tip: 1 lb. beef top round steak, cut ¾" to 1" thick or flank steak may be substituted for top sirloin steak. Prepare recipe as directed above.